DryBlend technology: delivers moisture-wicking properties. Seamless twin needle 2,2 cm collar. Twin needle sleeve and bottom hems. Quarter-turned to eliminate centre crease. Size (Chest to fit ins): S: 34-36, M: 38-40, L: 42-44, XL: 46, 2XL: 48, 3XL - 50-52. 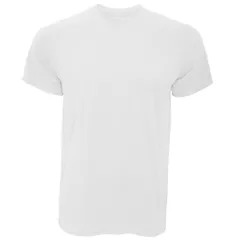 Weight: 190g/m² (180g/m² in White). 50% Cotton, 50% Polyester pre-shrunk jersey knit.